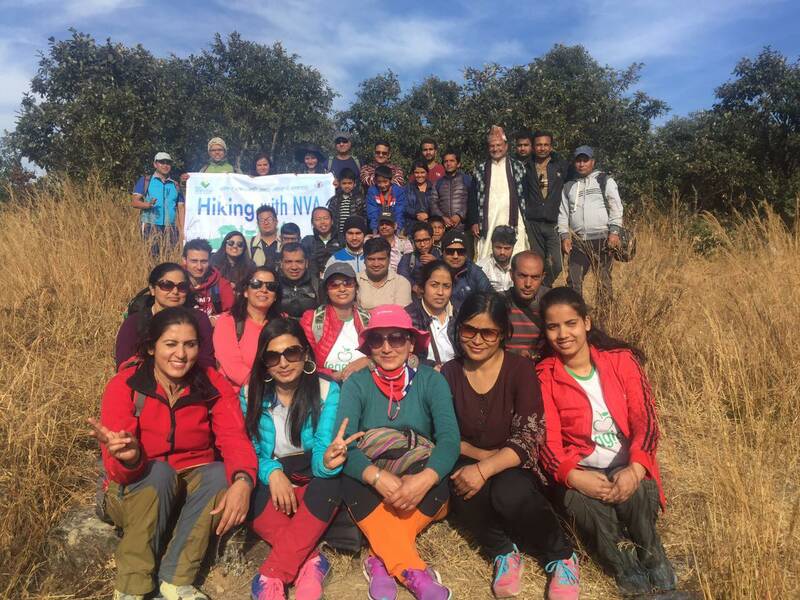 Nepal Vegetarian Association successfully conducted its monthly hike in the picturesque trails of Champadevi hill and surroundings. A 45-minute drive from Bhrikutimandap took all the hikers to Bhanjyang, from where the hike was to begin. There were altogether 42 hikers from different age groups and backgrounds. The first 30-minutes of the hike in the shadow of pine forest in a narrow and steep slope was a bit demanding. Everyone was panting and was in search of a place to rest. Everyone took a short rest in the middle of the forest to catch the breath before resuming the hike. As soon as they reached the meadow near the Himalayan Height Resort, everyone felt the sigh of relief knowing that for the next 1 hours there won’t be any steep climbs. The hikers continued the hike on the ridge overlooking the magnificent Himalayan range. The clear weather made the hike even more pleasant. The fluttering prayer flags that hung over the forest added a sense of calmness and serenity to the hikers. Everyone was busy capturing the beautiful vistas through their lens. The clear view of the mountains up and the bustling Kathmandu valley down was a pleasant view everyone cherished and took as an inspiration to move ahead. After an hour of pleasant walk on the ridge, a well-made path of stone led all the hikers to the Champadevi hill. The next 1-hour hike was a bit daunting. The uphill walk in the stepped road exhausted everyone. Finally, everybody was able to make up to the targeted destination at the top of the hill, albeit in a different time. A grassy slope with a beautiful view was chosen as a place to relax and to savour the lunch. Everyone relished the lunch to its last bit as the last 3 hours’ hike had burned a lot of calories and made everybody feel hungry. After lunch, there was an introduction session followed by meditation. Meditating in the middle of the was very relaxing and helped everyone to loosen up. Shri Kanchan Ghimire, an Art of Living instructor, guided everyone throughout the meditation. Mr Suresh Sharma and Mr Krishna Gurung jointly explained about the association, its future plans and the preparations for upcoming Asia-Pacific Veg Fest -2017 to be held in Kathmandu. Few hikers did impromptu donations for the organisation as well. After around 2-hours’ introduction and entertainment program in the middle of the jungle, everyone hiked down at their own pace. Mr Bijaya Raj Ghimire guided the hikers throughout the trail. The downhill hike was equally interesting. The songs sang in unison echoed inside the forest. Everyone was in the jolly mood. some hikers even danced in the jungle, gate-crashing a picnic. There was a brief stop near Himalayan Height Resort for a singing and dancing program before descending down finally. Even after a daylong hike, there was no dearth of energy with the hikers. The singing and dancing continued even inside the bus, thanks to Kedar Neupane for his impromptu folk duets. As every good thing must come to an end, so did the hike. Everybody finally reached Bhrukuti Mandap at around 6:00 pm with tired legs but happy hearts and an unspoken determination to be part of the next hike as well. The hike was a part of the fund-raiser campaign for the Asia-Pacific Veg Fest -2017 (APVC-2017) to be held in Kathmandu.